No. 32A, Jalan Dua, Off Jalan Chan Sow Lin, 55200 Kuala Lumpur, Malaysia. 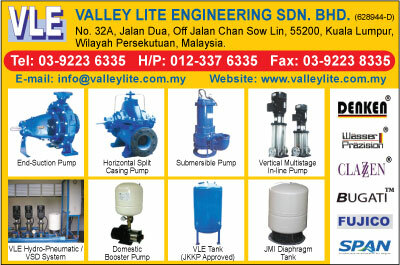 Valley Lite Engineering Sdn. Bhd. is a wholly Malaysian owned company actively involved in the supply of Quality Pumps & Systems, Control Panel and Related Equipment. With strong support from our Professional Management, Sales & After Sales Service Team, we have achieved an excellent reputation for our services. With our own M & E workshop, we are able to provide quality fabrication works on our systems & controls at reasonable prices. We at Valley Lite Engineering Sdn. Bhd. strongly believed in building long term business relationship with our valuable customers. We will gear every effort to focus on our customers needs in terms of stock, technical sizing & excellent after sales services. You can rest assure that we will be your ideal partner in pumps & systems.